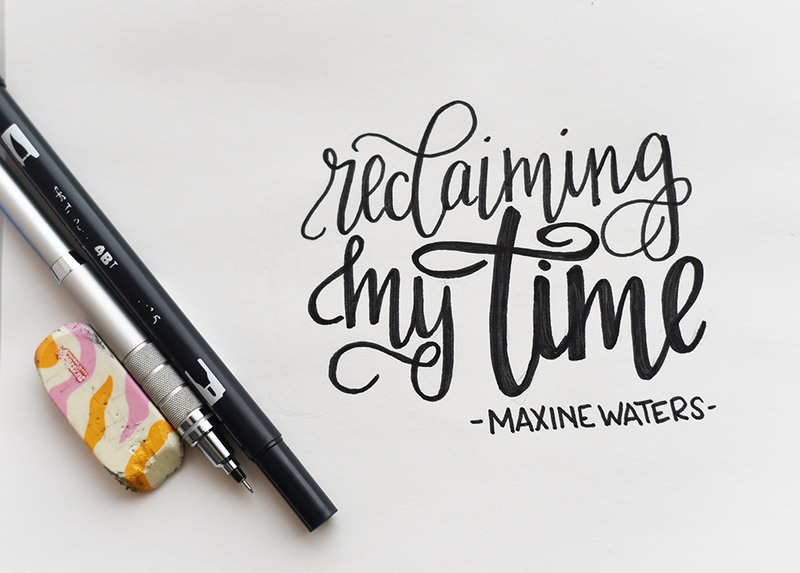 My Mantra for March: RECLAIMING MY TIME - Real life, on purpose. Can we take a moment to appreciate the brilliance of Representative Maxine Waters? Last year she gave voice to the self care mantra we all need: RECLAIMING MY TIME. Lately I’ve found myself on a streak of creative inspiration. Ideas that felt nebulous before are suddenly clicking into place. I’m getting helpful feedback and guidance from people who know what’s up. I’ve set myself ambitious but reasonable deadlines. Guys, I am so excited about all the good things I’m pulling together. But even in the middle of the excitement and passion and creativity, there’s fear. Fear of rejection, of failure, of disappointment. There’s overwhelm and indecision and all those other delightful emotions that show up when you step out of your comfort zone. And here’s a long overdue “crazy brain” update: I’m in the process of weaning off my depression + anxiety medication. There’s probably never going to be a perfect time for that, so why not now? I’ve got a green light from my doctor and feel confident I no longer need the meds the way I once did. Still. I’m a little on edge, wondering how this is all going to go down. I am exercising regularly for the first time in YEARS. When I don’t get enough sleep during the week, I sleep in or nap on Saturdays to fill some of that sleep deficit. I prioritize meal planning. A lot of my decision fatigue comes from feeding my family, so I’m simplifying the process as much as I can. I’ve worked in time to take stock photos AND hang out with my kids by planning mini-adventures for us each week. Every day I take 20 minutes or so to do nothing but listen to an inspiring or uplifting or funny podcast. I don’t hesitate to tell my kids, “I’m working right now and you need to entertain yourselves.” Then, when I finish (usually within half an hour or so) I do something to connect with them without distractions. I bake. A lot. We’ve had homemade bread almost every week this year. When I watch TV, I keep it light: comedies or Great British Baking Show only. I pay attention to how I feel while consuming social media and spend less time in general on it. Basically I’m looking closely at how I use my time. The things that bring me life + energy + joy get top priority. If something is draining me of energy, I eliminate it if possible. If cutting it out isn’t an option, I simplify, minimize, or just remind myself how glad I’ll be when it’s done. Because my time is mine. If I don’t choose how I use my time, someone or something else will decide for me. And I’m not interested in giving up that choice.